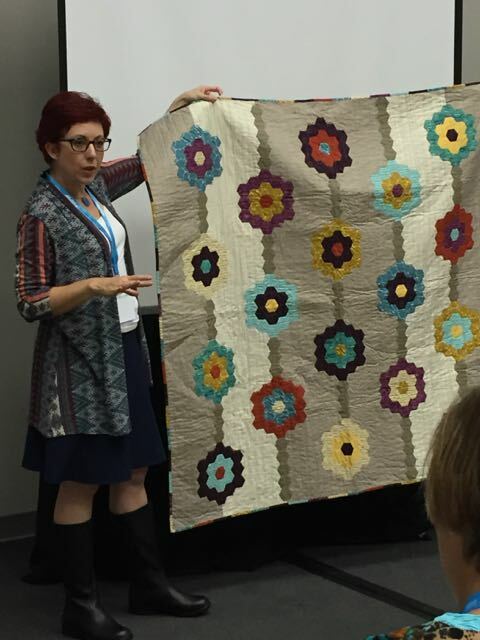 Carrie’s shared with you so much of the amazing-ness of Quilt Market. It’s a sight for sore eyes (and it creates sore feet, unless you’re like me and refuse to wear anything but comfortable shoes). While it’s mostly delightful, it also creates frustration. And that’s because, no matter how much we wish it weren’t true, we can’t do it all. Seeing myriad fabrics, gadgets, and techniques, taking in all that color, texture, and design, provides endless inspiration. If only there was a Quilt Market vendor who offered special deals on endless hours of sewing time! Since I have yet to stumble across that booth at Market, I’ve decided to take a new tack. I’m going to focus on just a couple of new things I want to learn. The first is English paper piecing, or EPP as those-in-the-know call it. I realize I’m late to this party but it’s something I’ve been dying to try, and a Schoolhouse presentation further whetted my appetite. Jess Finn of Paper Pieces teamed up with author Diane Gilleland to share Diane’s new book, All Points Patchwork. The book is filled with great tips about paper piecing in general, as well as what she calls “project inspiration”—ideas for ways to use paper piecing that won’t take years to complete. That’s my kind of sewing! Different shapes that work together are labeled by package color. These (yellow) 1″ diamonds will work with the (yellow) 1″ hexagons. I was also really intrigued by the way she combined different shapes of EPP. And this is where Jess Finn comes in. 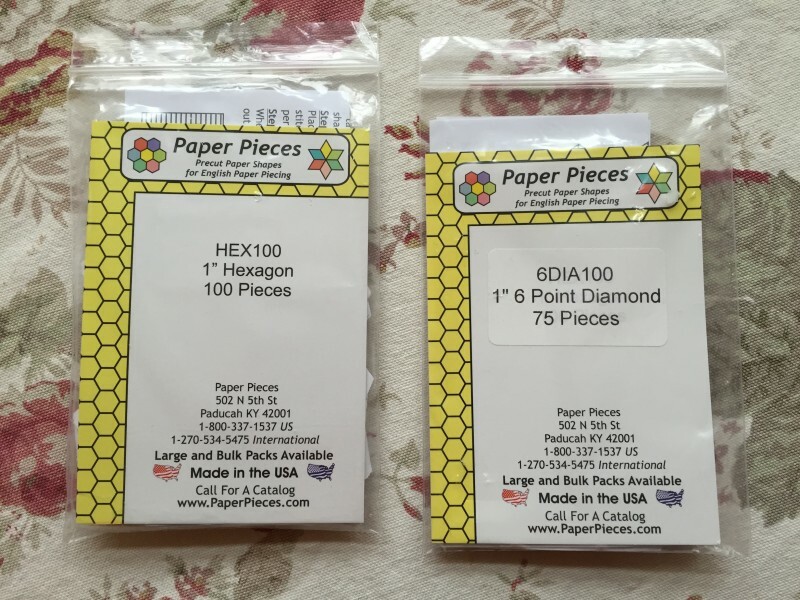 Paper Pieces offers packs of paper templates in shapes from the tried-and-true hexagons to kites, pentagons, clamshells, and Dresdens. And to make putting them together simple, the pieces that match are packaged in color-coded packages: yellow for 1” pieces, purple for 2” pieces, and so on. It’s ingenious and takes the guesswork out of making sure selected templates work together. That kind of coordination reduces stress for newbies (like me). 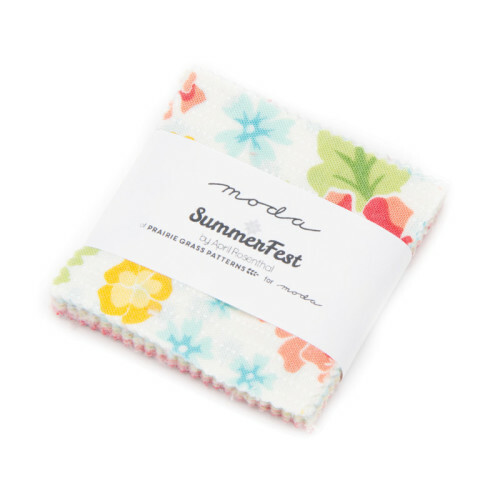 I also like that the 1″ pieces work with Moda candy—like these new lines by Leila Boutique and April Rosenthal. If I decide to try fussy cutting, which creates so many fantastic secondary patterns, PaperPieces offers acrylic templates. And since last year I’ve been intrigued by these Kathy Doughty Hex Essentials. But one thing at a time…I’m trying to avoid Market overload! The back of Diane’s EPP is almost as pretty as the front. If you enjoy English paper piecing, I’d love it if you’d share any tips to get me started successfully in the comment section. I need all the help I can get! I’m enjoying the quilt market posts … I have never been to a Quilt Market, and am a fairly new quilt shop owner. I don’t see a market attendance in my future (do other small quilt shop owners travel the distance go to such a market? Do they close their shops while they’re gone?) It’s an interesting concept, and i’ve learned that it does impact me as a small shop … orders I place with fabric representatives are often delayed, and lower priced fabrics are often ‘out of stock’ before delivered because the quilt market buyers have priority … Is there ever a Quilt Market held in the northern New England area? 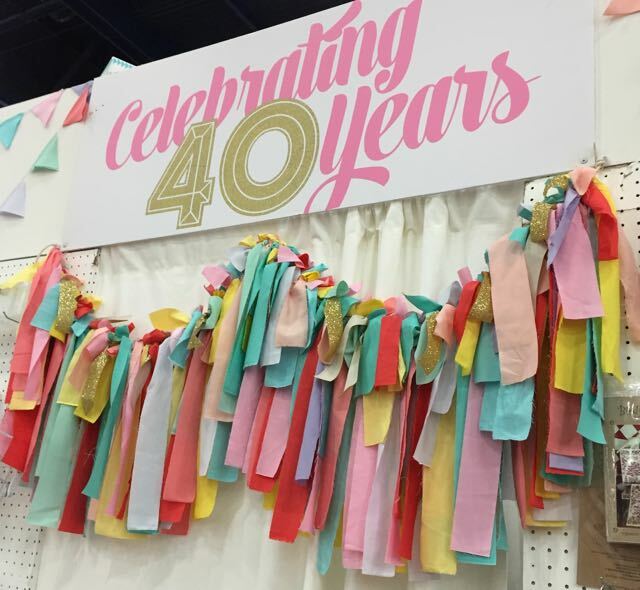 Quilt Market is always held in Houston in the fall and rotates between cities in the spring. The closest it comes to New England is Pittsburgh. When I first started, I read about using a paper punch to punch a hole in the middle of each paper piece. When you lay the paper against your fabric, put a pin in and out thru the hole to hold the fabric and paper together so it doesn’t shift when you sew. Worked like a charm for me. Good luck! And the hole in the paper makes popping out the paper very easy especially if the basting is not done through the paper. 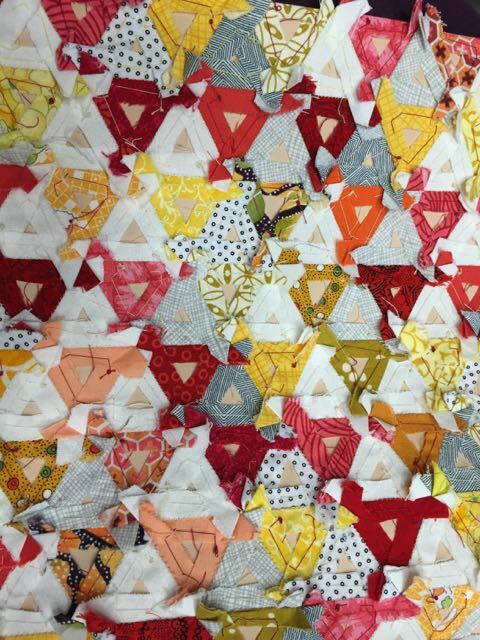 I’m currently involved in two EPP quilt-alongs: Katja Marek’s The New Hexagon – Millefiore Quilt (it was shown at Market) and a Facebook group, Mystahhhhry Along with Hillbilly. 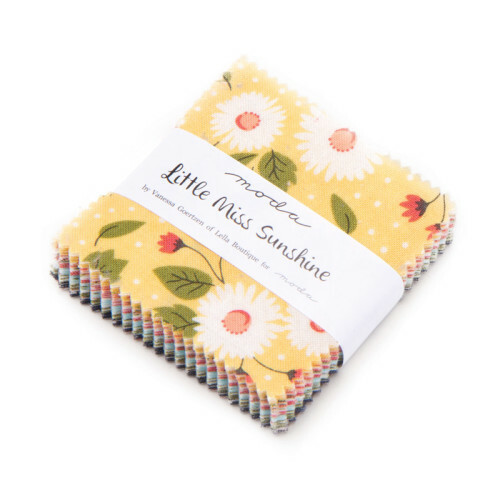 Trudie’s tip is spot-on – I punch a small hole and use little applique pins for my hexies, when I don’t glue-baste – which I mainly do on odd-shaped pieces or when fussy-cutting. I’m a glue baster too…. on smaller shapes especially. often bigger shapes are better stitch basted. Diane’s book is fabulous and teaches you everything you need to know! Jump in and have fun with it. I really enjoy EPP… but I’m no pro. I first started years ago with a plastic template method. Each template had a circle cut out of the center and you hand basted the fabric around the template. Once it was sewn completely into your project, there was a tiny dowle thingy that you could use to pop the plastic out. I had many problems with this method. I did not love it. I say don’t go there, I was also doing a traditional Grandmother’s Flower Garden setting thing. That got old. So, I started a new/different project. Very scrappy, no rhyme or reason. All Fig Tree fabrics, because those are my fav and I could NEVER get bored. Also quick, because it’s scrappy and I don’t have to do a lot of thinking/planning. Also, true to the name, I’m using paper– LOVE that method. Here’s a fun tip… I bought a paper punch of the size hexy I wanted from the scrapbook section of my local craft store and I cut all of my papers from my junk mail envelopes. Well, are bills junk? Huh….. that’s debatable, but I use a thicker envelope that I might have trashed and it makes lovely papers that would have been wasted. I’m happy for you to begin this adventure. It’s fun to having stiching to do on the go. Enjoy! Great projects.I`ve just finished a hexie pouch and I enjoy playing with hexies while I`m watching tv. epp aficionado here! I can’t believe I didn’t know about the color coordinated pack pieces. Ingenious. What I’d like to know is what you do with all the strips of fabric that were booth decor. I would dearly love to buy them 🙂 I’m a scrappy girl and those would pump up my depleted stash! I love EPP. I baste, remove the papers as they are surrounded by other shapes. Sometimes I fussy cut, although I hate wasting fabric. EPP is delightfully mindless. The best part is selecting your fabrics and figuring out where you’ll put them, and then totally changing your mind. You can listen to NPR or watch TV and EPP. It’s a delight! If you use the Applique Paper pre cut EPP you don’t have to take out the papers when you are done. I love the new way to do EPP. Use a very fine needle and Superior’s Bottom Line Thread. You won’t see you stitches. This hand sewing takes time so do it only if you enjoy the process as much as the finished result as even a small project will take a lot of time. If you are punching your own papers, consider using blow-ins, those subscription cards that fall out of magazines. They are a good weight for this work. Best not to start………….it’s like a terrible addiction and you just can’t stop and you keep thinking of new things EPP you want to do or how pieces can go together………. but hot tips for the new addiction – glue pens, the right needle and thread (bottomline one mentioned in the previous comment) also help hide your stitches better…………..there are no rules if it fits do it………..and I love my fussy cutting viewers and mirror….including link below so you see what I am talking about………..
Once your starting to take papers out a tailors awl is sooo handy to slip in under the fabric and release the glue……..if it’s too hard to pull off your using too much glue………..
do a good job on preping your fabric onto the papers and everything goes beautiful from there………..
Oh and there are so many other great shapes other then hexies……………..